The FC Jensen Home, shown in its current state. The front of the house is shown on the right side of the picture. F.C. 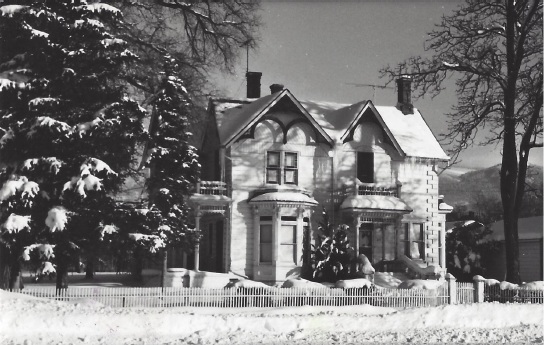 Jensen, a Danish settler, built this Victorian home on 200 South and 200 West in Mt. Pleasant in 1891. The Jensen family ended up leaving the LDS Church and joining the Liberal Party, which offered a political and educational alternative to the LDS culture. MT PLEASANT — The Frederick Christian (F.C.) Jensen home is one of Mt. Pleasant’s standouts. What makes it more remarkable is that Jensen built it not for his own family but for his mother, Maria. 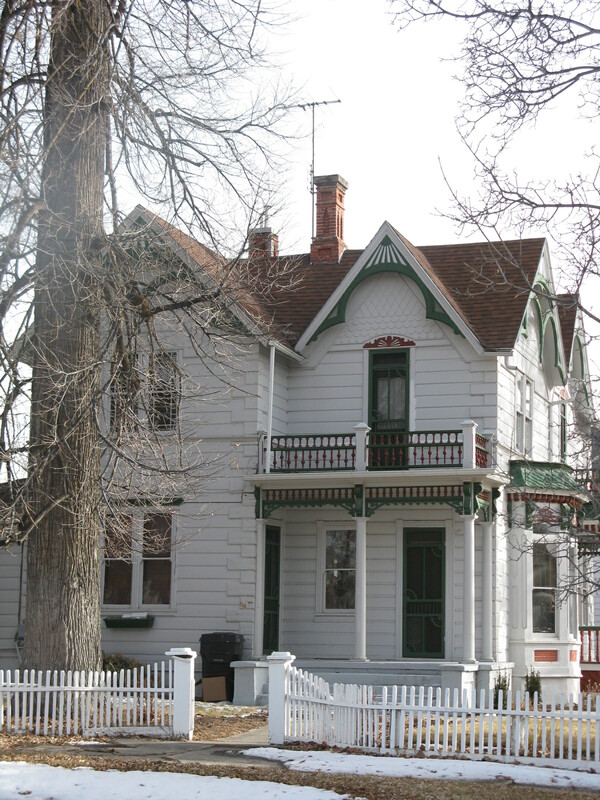 Jensen, a prominent Danish settler, Sanpete County businessman and Presbyterian, built the majestic two-story home on the corner of 200 West and 200 South in 1891. It was added to the National Historic Register in 1982. The hose is a beautiful example of Victorian architecture with its Eastlake porches and Carpenter Gothic gables, according to the building’s registry with the U.S. Department of the Interior Heritage Conservation and Recreation Service. The superior architecture reflects Jensen’s craftsmanship. Among his many business ventures, Jensen owned what was considered one of the finest furniture stores in the region. The exterior of the home features four main gables decorated with alternating bands of diagonal and fishscale shingles. The two main porches have flat roofs with columns decorated with scroll brackets at the top of each column and fancy balusters. The north parlor, one of two in the home, featured a half-octagonal bay window. In the Danish tradition, the porch columns and balusters were originally painted in bright colors, according to the registry. The woodwork throughout the home and the ceilings in both parlors were once intricately painted by a Danish artist, recalls Winifred Steadman Colwill, F.C. Jensen’s granddaughter. The home also features a very large kitchen and dining room in the back of the home, as well as a very large back porch. “They entertained a lot of visitors,” Colwill says. Upstairs were three bedrooms and one very large bathroom, which was the only original bathroom in the home. The home was filled with Danish furniture including tall, hand-painted bureaus. Colwill visited the home frequently during her childhood and lived there with her grandmother as a high school student and in the summers during her college years. One parlor was used as a music room, and it housed a beautiful grand piano. The room also features an Italian tile fireplace, which is still there today. Sadly, one of the painted ceilings was destroyed when a pipe burst in the music room during a very cold winter. During the 1940s and 1950s, the family closed up the home during the winter because it had no central heating, and they would live at another residence in California. The water damage had become substantial before the family discovered it later in the spring. The ceiling had to be completely replaced. Gratefully, the grand piano was preserved by a plastic cover, Colwill recalls. The family sold the home to Wasatch Academy in 1954 for a very modest price, says Donna Glidewell, the school’s historian, who also lives in the home for a period in 1991. The home is used today as a private residence by a member of the school’s faculty. F.C. Jensen and his twin Peter James were born in 1858, They were named after the King and Prince of Denmark. In all, Maria had five children. Their family ran an inn in Odense, Denmark, until F.C.’s father passed away. He and his brother were the youngest in the family and were grade-school age when Maria converted to The Church of Jesus Christ of Latter-day Saints. The family immigrated to Utah in 1862. “They throught they were coming to live a better life,” Glidewell says. However, Maria broke her hip during the wagon ride and never fully recovered. She became dependent on her children to take care of her. In addition, Maria spent the family’s entire life savings to pay for their travel and those of 19 other early Danish saints. She was promised by church leaders in Denmark that she would be reimbursed for the travel costs of the additional saints when they arrived in Utah. Colwill says that when Maria Jensen arrived, authorities told her they considered the money she spent “a gift” to the saints. But Maria and her family fell away from the LDS Church for another reason, says Glidewell, who has read the family’s history book. The bishop quarantined F.C. and his brother for having smallpox one winter. It was normal procedure for them to hang a white flag outside their home as a warning of sickness to others. However, the bishop extended the quarantine through the spring, even though the boys were well again. Against her bishop’s orders, Maria directed her sons to pursue the spring planting, while posting a white flag nearby as a compromise. She felt she had no choce, as the spring planting was the only way that the family would be able to provide for themselves that year. Glidewell says the bishop confiscated their horse as punishment for their disobedience. The family returned to the Lutheran faith they had practiced in Denmark before converting to the LDS Church and they joined a movement called the Liberal Party, Glidewell explains. Prior to 1896, when the State of Utah instituted the public education system, children were schooled privately through religious programs. The Liberal Party provided an alternative education program outside the LDS Church, in addition to pursuing other political activities. F.C. Jensen was mentored by Duncan McMillan, a Presbyterian minister who arrived in Mt. Pleasant in 1875 and who later founded the Wasatch Academy, originally a Presbyterian school. However, Jensen never pursued the ministry. “F.C. loved McMillan, but he couldn’t follow in his footsteps by going to college because he couldn’t leave his mother,” Glidewell says. Instead, Jensen married a local woman of Swedish descent named Edie Elizabeth Nielsen and pursued a number of local trades. In addition to running a state-of-the-art furniture store, he was a sheep herder and ran a successful freighting business throughout Utah. “He was honest in his dealings and had a good reputation,” Colwill says of her grandfather. And he built businesses through trial and error. Colwill describes a heartbreaking business delivery that illustrates the odds Jensen was up against. Jensen won a contract to transport a heavy air compressor for a mine from Omaha to Salt Lake City. The machinery required a special wagon and yoke. Jensen had purchased a large team of extra fine blue Texas steers to carry the load, but four of the seven oxen in his team died along the trail, and Jensen had to trade the remainder for a team of horses. He was able to complete the trip to Salt Lake, but he and his brother were robbed in Salt Creek Canyon and came home penniless. Later in his life, when his determination paid off, Jensen would hold titles such as vice president of the Utah Banker’s Association, president of the school board, and member of the Board of Directors of the Sugar and Livestock Association. Jensen was a prominent member of the Presbyterian Church. Colwill has also been a member of the Presbyterian faith her whole life, but one of her best friends at Wasatch Academy was LDS, and she has remained friendly to the LDS Church. Colwill moved back east with her husband as an adult, but they have maintained a cabin in Fairview Canyon that they visit each summer. “We love to go to the mountains. We like to camp in the national forest near there,” she says. Although F.C. Jensen never went to college, he played an important role in providing a quality education for his children and grandchildren. Colwill was a member of the first graduating class as Wasatch Academy. “My parents wanted me to be educated,” she says. Colwill studied education in college and chose to become an elementary school teacher. Jensen died in 1928. “I never knew him,” Colwill says. But she says his hard work and sacrifices provided her and her family with a good life, for which she is grateful.